As the drumbeat of “Medicare for all” approaches a crescendo with the advent of the 2020 presidential elections, we should take a moment to fully analyze what the idea entails. For the proponents of the concept, the argument is decidedly one sided. They speak of our “right” to quality medical care and extending coverage to all Americans. The side of the argument rarely touched on, however, is how the “Medicare for all” concept could be realistically applied. Beyond saying, “Well, we just pay for it!”, the structural layout of how it would work is largely missing from promoter's arguments. Frankly, I am quite surprised by the general public's ignorance surrounding Medicare, how it functions and how it is perceived as being easily expanded to all across the nation. Many people view it simply as “free” health care provided to special classes of citizenry; primarily senior, with other smaller groups qualified to receive it. Understanding the mechanics of the system as it exists today is essential for analyzing the feasibility of expanding it to the broader population. Today, one reason Medicare works is it is mostly financed by the many for the benefit of the relative few. Funding for Medicare comes primarily from general revenues, payroll tax revenues, and premiums paid by beneficiaries. Other sources include taxes on Social Security benefits, payments from states, and interest. According to AARP, there are currently 44 million beneficiaries enrolled in the Medicare program. That is about 15 percent of our overall population. Medicare Part A is largely financed through a 2.9 percent tax on payroll earnings and is paid by employers and employees on a 50/50 basis. The revenue collected from those tax receipts accounts for 88 percent of Part A revenue. Higher-income taxpayers (more than $200,000/individual and $250,000/couple) pay a higher payroll tax on their earnings. That rate is 2.35 percent. In 2013, total revenue for Medicare Parts A, B and D was $575.8 billion. Of that amount, 41% came from general revenue, 38% from payroll taxes, 13% from beneficiary premiums, 2% each from state payments and taxes on social security, and 3% interest and other sources. It is interesting to note that today only one in 10 beneficiaries relies solely on the Medicare program for health care coverage. What happens when 100% of us rely on the system for 100% of the costs? We should also take a moment to observe that little tidbit about beneficiary premiums. While many people have gleefully embraced the “Medicare for all” scheme as a path to free and easy healthcare, the fact remains that it is not free today for those currently in the system. There are premiums, co-pays and exceptions that can cost beneficiaries thousands. That is largely reasonable given the benefits received, but those facts are not being conveyed today by those seeking to expand Medicare's coverage horizons. The harsh fact remains that we simply cannot add 310,000,000 people to the Medicare system without dramatic changes to both service levels and expense structure. Free healthcare is not free, and from a funding perspective the model being promoted for the masses cannot exist in its current form. People promoting the concept should be honest with that fact. There is another aspect that must also be considered when engaging in the Medicare expansion discussion. Medicare today excels at controlling costs with its primary tools being a blunt hammer and sharp machete; instruments used to slash reimbursements to healthcare providers. Many specialists will not accept Medicare patients as a result. As of 2015 80% of physicians were accepting new patients with private insurance, but only 72% were doing so for Medicare patients. Proponents of “Medicare for all” tell us that doctors will accept Medicare when it is the only system available to them. That might be true, but the likelihood of a doctor continuing to practice or another coming along to replace them at retirement will be far less certain. Simply trying to control costs by cutting reimbursement rates will continue to result in a declining level of service availability. Perhaps the concept could be revised, say, to a shorter window of time. If we agreed to cover everyone with Medicare for just two weeks a year (but then have no Medicare coverage for anyone the rest of the year) we might be able to make this work. If we used the last two weeks of October, the traditional beginning of open enrollment for Medicare, we could call it “Medicare for Fall.” Everyone could get all the free health care they desire, we could spend the next 50 weeks paying for it, and promoters would have a concept that at least sounds very close to what they have been hawking. A win, win, win if we ever saw one. If you don't like that idea, it would probably be best to start talking about fixes to our healthcare system that consider all the requirements necessary. Promoting an unrealistic pipedream to people ignorant of the details is not serving anyone well. If that is what they insist on doing, we'd just be better off with Medicare for Fall. There have been 1 comments made! "A Place Online for our CEO to Opine"
Robert Wilson is President & CEO of WorkersCompensation.com, and "From Bob's Cluttered Desk" comes his (often incoherent) thoughts, ramblings, observations and rants - often on workers' comp or employment issues, but occasionally not. Bob has a couple unique personality characteristics. He firmly believes that everyone has the right to his (Bob's) opinion, and while he may not always be right, he is never in doubt. Enter at your own risk, and like all of our blog areas, we encourage you to read the disclaimer at the bottom of the page. Bob is an accomplished speaker for the workers' compensation industry. He is available for conferences, corporate events, children's birthday parties and Bar Mitzvahs. You may access his Speakers Brief here. 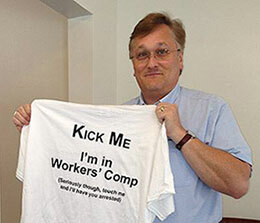 Join Bob and almost 20,000 employers and professionals on his LinkedIn group - the Workers Compensation Roundtable. Join here today!